Did Jenner really see a UFO, or is she trying to cash in on the attention Crowe received? It would not be too surprising if she really did see something. Just last month the Mutual UFO Network received over 50 sighting reports in the state of California. We’ll see if she says anything more about the event in the next few days. 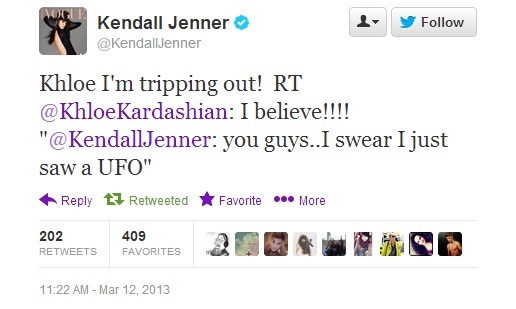 Tweeting UFOs seems to more and more popular with celebrities. Besides Crowe and Jenner, Demi Lovato, Billy Ray Cyrus, and Victoria Beckham, are just a few others that have tweeted their UFO sightings.